Bob Watson keeps history alive. The word “beachmaster” sets his place in history. 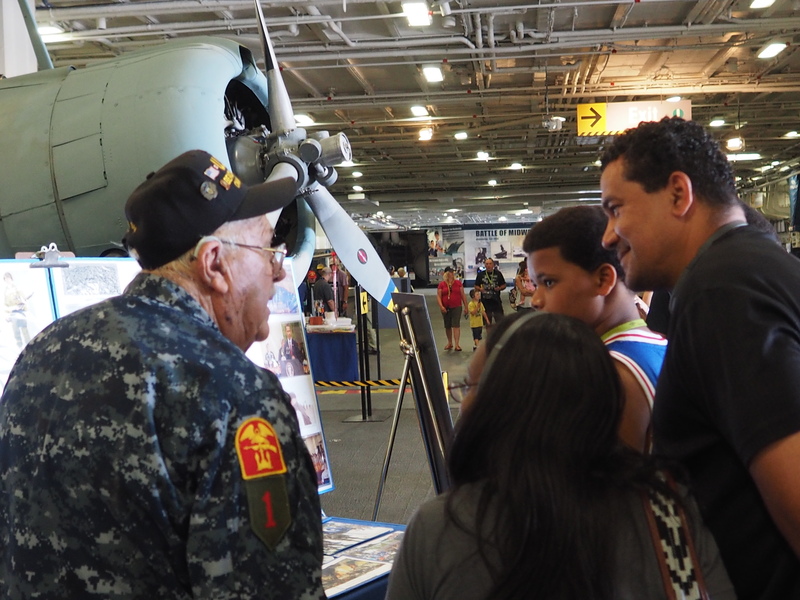 Truthfully, when I met him last Saturday and saw the word embroidered in white threads beneath U.S. Navy on the octogenarian’s blue camos, I had to look the word up. You see, in my line of volunteerism as a marine wildlife docent that chats up northern elephant seals, the word “beachmaster” has an entirely different connotation. 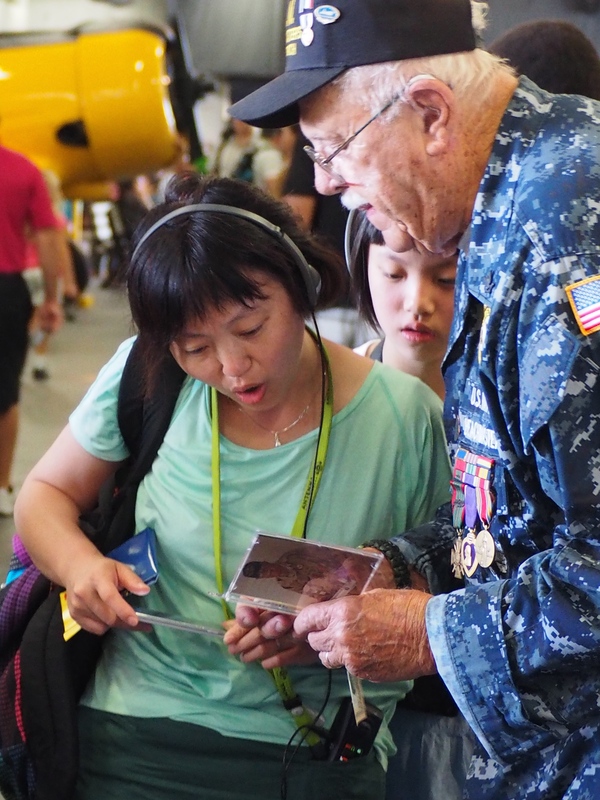 But for Bob Watson, a World War II veteran who was part of the first wave of the young men that stormed Omaha Beach in Normandy seventy years ago, his job as a beachmaster brings him celebrity today. No! He’s more than a celebrity. How about “…a national treasure,” according to Cmdr. Chris Nelson, BMU-1’s commanding officer? On the 6th of June in 1944, D-Day, the weather was drizzly, cold and rainy, complicating a horrific scene of chaos. About 1,000 yards from the beach, Bob’s landing craft – an LCM (Landing Craft Mechanized) holding 71 Big Red One (1st Infantry Division) troops and four Navy Beach Battalion crew – hit a Teller mine and exploded. 55 men were killed instantly, body parts flying, and Bob was thrown out…After submerging for some time due to the heavy kit all soldiers and sailors hitting the beach were wearing, his flotation device brought him back to the surface gasping and in shock. Quickly he was picked up by a Zodiac ferrying floaters to the beach. Responsible for 1/18 of Omaha Beach, which is a little over five miles in length, the 6th Beach Battalion lost 25% of its personnel on the way to or on the beach. When Bob touched the sand it was about 7:47 a.m. Terror and chaos reigned. Saving Private Ryan’s depiction of the scene could do only faint justice to the true horror American servicemen were experiencing on the beach. Everything was on fire. Landing craft were burning, their ammunition blew up, bodies and parts of bodies littered the beach, and the Germans, who had excellent equipment and training, poured on the machine gun and artillery fire. 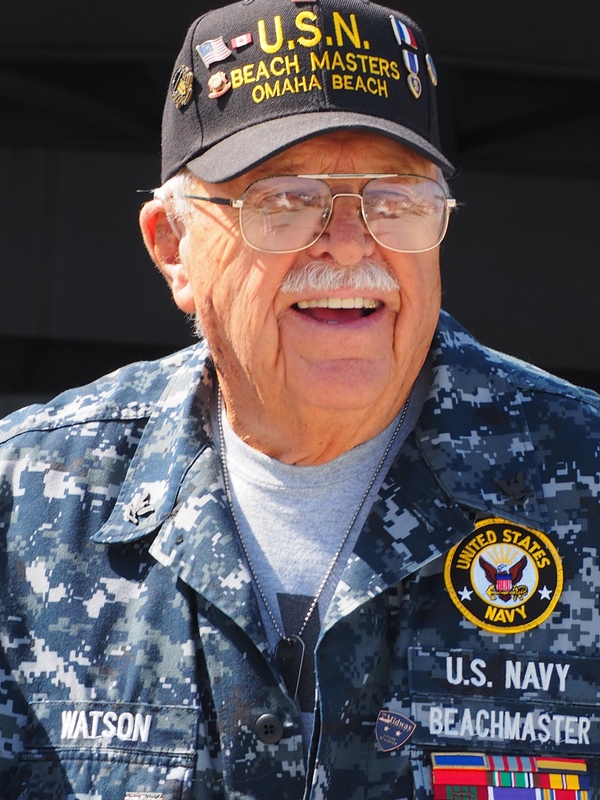 As beachmaster, Bob’s job was to “keep the troops, materials, equipment and vehicles moving up the beach.” He forged ahead and helped an Army medic, fired off rounds, and commandeered a bulldozer to clear debris and cut in a road for troops and vehicles. That’s when the bulldozer hit a bouncing Betty anti-personnel mine. Bob survived that explosion too. He stayed on at Omaha Beach for 28 days. But how did I come to meet this amazing person last Saturday? 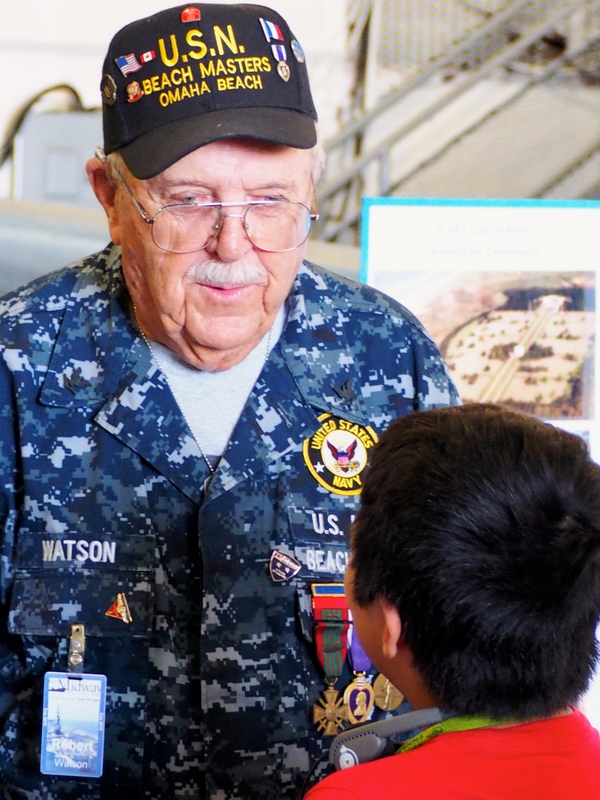 We helped Bob get his gear out of his car while he slid into his blue camo jacket, laden with purple and gold medals. We followed him thru the massive ship’s maze as he told officials, “They’re with me,” and the officials waved the three of us thru. 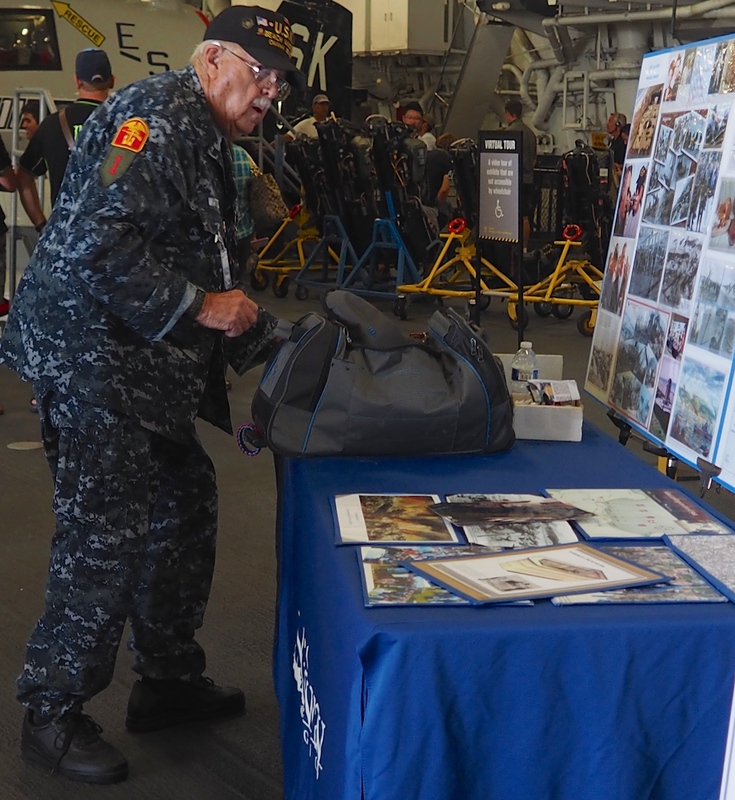 For the next 45 minutes we helped Bob carry and set up an 8-foot table next to a roped-off vintage airplane; I covered the table with a blue cloth that read “ USS Midway Museum,” and Bob said, “You’re definitely a volunteer. How can I tell? You know how to set up a display.” I laughed as we each broke out a sweat in the warm innards of that massive WWII vessel. A crowd began gathering around the display of priceless photos, and news clips. Like a magnet, young and older folks circled Bob, asked questions and listened as he shared his tales of an American youth’s exceptionalism 70 years back.